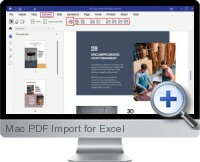 Mac PDF Import for Excel (PDF to Excel for Mac) is a program for Mac users that converts PDF file content into spreadsheets on Mac OS X. Resulting spreadsheets in Excel for Mac can be edited, modified and used for calculation and data analysis. Layout Preservation - 2 options are provided for the imported data: retain values without formatting, or retain original formatting to preserve text, numbers and formatting from the original PDF file. High Efficiency - PDF data is imported to Excel very quickly with conversion of a 100 page PDF file in less than 1 minute. Supports batch conversion and partial conversion of PDF documents for efficiency gains. High Compatibility - supporting Adobe PDF 1.0-1.7, Excel 2004,2008,2011 for Mac and does not require Adobe Acrobat. Supports encrypted PDF Files which are imported directly and an open password can be entered to process open password protected PDF files. Easy to use with drag-and-drop functionality supported. Supports multiple languages: English, Turkish, Thai, Latin, Korean, Greek, Cyrillic, Japanese and Chinese.